As support slowly builds for a regulatory budget in the House and Senate, it’s important to take note of the possible benefits of a proper cost accounting for the regulatory state. A high-end scenario, for a true one-in-one-out budget, could save the nation $98.7 billion in annual regulatory burdens. S. 2153, the “National Regulatory Budget Act,” introduced by Senator Marco Rubio, would establish an “annual overall regulatory costs cap” and prohibit agencies from promulgating “a new covered Federal rule that increases regulatory costs.” The American Action Forum (AAF) reviewed Senator Rubio’s bill when it was first introduced, finding that it could save the economy roughly $75 billion. H.R. 5184 is the companion bill in the U.S. House. S. 2988, the “Regulatory Cost Assessment Act,” would “establish a baseline projecting the federal regulatory cost over at least five fiscal years” and include budget levels for these costs during the next five fiscal years. H.R. 1155, the “SCRUB Act,” would establish an independent commission to determine which past regulations are duplicative or obsolete and create a “cut-go” pool of regulations to remove when an agency seeks to implement a new measure. The first two bills require an agency to determine the total cumulative cost of regulatory burdens, a difficult task, and then set a regulatory budget, just as Congress sets one for fiscal priorities. H.R. 1155 would establish a British or Canadian style one-in-one-out system for new regulations. Past regulatory burdens can help to project some of the annual savings. For a prospective regulatory budget, looking at the record-setting Obama Administration provides a guidepost. From 2009 to 2014, the administration averaged $15.7 billion in new annual final rule costs (unadjusted for inflation). Congress is unlikely to set any prospective regulatory budget that high, but recall that the administration’s new ozone rule could impose $15 billion alone, leaving little for other agencies. (EPA would quickly become the “mandatory spending” driver of the regulatory budget world.) Of course, these historical figures don’t represent cumulative past regulatory costs, just recent history. Congress could pick the least costly year from this administration (2009 at $7.9 billion in net burdens) and use that as a regulatory baseline. In other words, in future fiscal years, regulatory agencies could only impose $7.9 billion in new economic burdens, with individual agency budgets as a subset of this figure. 2010 Savings: $9.98 billion ($8.03 billion budget compared to $18.01 billion in actual burdens). 2011 Savings: $920 million ($8.28 billion budget compared to $9.2 billion in actual burdens). 2013 Savings: $630 million ($8.57 billion budget compared to $9.2 billion in actual burdens). 2014 Savings: $8.1 billion ($8.71 billion budget compared to $16.9 billion in actual burdens). These savings represent the low-end potential because it assumes Congress would at least raise the budget with inflation, although they would not be required to do so, and the regulatory costs from the past are unadjusted for inflation. Making the correction, this form of a regulatory budget could save $46.2 billion in today’s dollars or $9.2 billion annually. During the next ten years, it would save the economy roughly $92 billion, assuming the current level of regulation persists for the next decade. Given, the demands from the remnants of Dodd-Frank and the Affordable Care Act, and the increased push to regulate greenhouse gas emissions, these projections are not implausible. As the American Action Forum (AAF) detailed here, countries with flexible regulatory budgets are doing just fine. Canada and the United Kingdom both have healthy economies with falling pollution rates and lower greenhouse gas emissions. They also generally repeal a past regulation for every new measure. What would this look like for the U.S.? The SCRUB Act has a modified version of a regulatory budget. An independent commission would establish a “cut-go” pool of past regulations that would allow regulators to remove a regulation from the pool whenever they decided to implement a new measure. Overall, SCRUB set a 15 percent reduction goal for cumulative regulatory costs. As AAF found earlier this year, meeting such a target could save approximately $48 billion. However, exceeding the scope of SCRUB and assuming one-in-one-out for all regulations could reap even greater benefits. From 2009 to present, regulators have added $98.7 billion in new annual costs on the economy. Assuming a strict balanced regulatory budget approach could save the nation that same sum, while forcing government to clean the slate of inefficient past rules. The United Kingdom actually has an even more aggressive one-in-two-out system, although there are several exceptions. Regardless of the form of a regulatory budget, it’s clear that any flexible approach could save billions of dollars in economic costs. Beyond the monetary benefits, a budget would also allow government to look back at past rules to determine the efficient attempts at regulation and the obsolete and burdensome approaches. 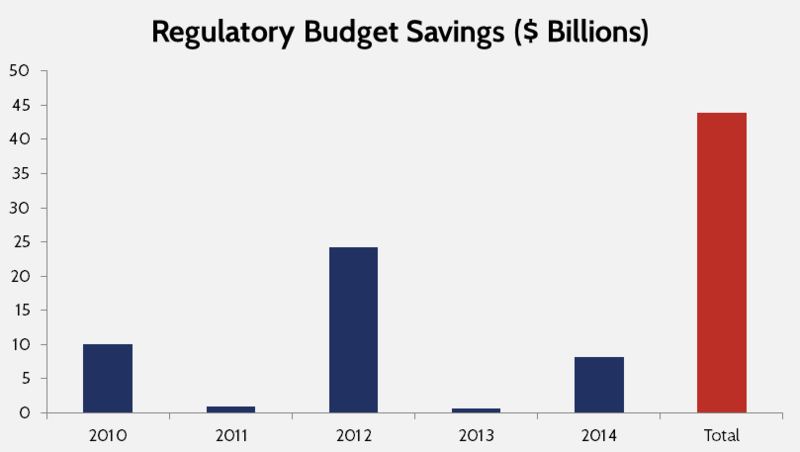 Whether the savings are $43 billion or $98 billion, a regulatory budget warrants scrutiny by policymakers on Capitol Hill.